Durch die Verwendung der Verbreiterung, deren untere Kante am Radlauf anliegt, wird zusätzlich der Effekt erreicht, dass der Kotflügel optisch weiter nach unten gezogen wird. Auch bestens geeignet als unauffälliger Radlaufschutz. Nissan Micra K11C Facelift models 1997 - 2003. This kit enhances the style of the car and makes the profile lower. NISSAN WHEEL ARCH STYLING KIT. Nissan part number is KE760-6F000. Stand apart from the rest with our image altering Navara NP300 front grill complete with the super bright LED daytime running lights (DRLs). 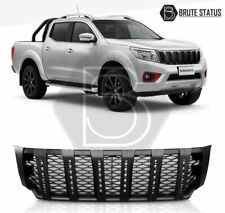 -Made from high quality ABS plastic -Includes x6 LEDs light bars (can be wired as DRLs or however you please) -Straight forward and reversible fitting, uses all existing fastening points -No drilling to your truck for fitment -Smooth black finish looks great and tough -Includes everything needed to install (please note: no instructions) -This grille is for the Navara NP300 2015 and on model years. These look great paired with of our wheel spacers to give your truck a totally new look. CHECK OUT OUR OTHER LISTINGS BELOW. Body Kit, Body Clading- Nissan Navara NP300 2016 . Nissan Navara NP300 Double Cab 2016 (4 door vehicle). O nly fitting Nissan Navara NP300 2016 models. Easy installation by self-adhesive automotive grade tape. Nissan Navara D40 2006-2010 Wheel Arches. Very strong and well made from ABS Plastic with a gloss black finish. All 4 arches. Rear Wide quarters to fit any Nissan S14 S14a. Special order Carbon parts are made on order and dispatch can take up to 4 weeks. All our products have to be fitted by professionals. Your browser does not support HTML5 video. Small scratches.see photos. In working order. AEROKIT SPEC D1 REAR FENDERS. The Aerokit Bodykit fitting challenge @ Drift Allstars Wembley 2011 - YouTube. ALL AEROKIT© products MADE IN THE UK. See an Aerokit bodykit bumper being manufactured. FITS NISSAN 200SX 180SX S13. NISSAN 350Z (2003 - 2005). - FRONT PART OF THE FRONT INNER FENDER. Die Radlaufleisten gehen von Stoßstange bis zum Schweller und sind ca.50 mm breit. Die Radlaufzierblenden werden individuell für. Einen Satz 4 Stück Radlauf Zierleisten. Blenden ohne Bohren an den Radläufen befestigt werden. AEROKIT SPEC R1 REAR FENDERS 30mm each side. The Aerokit Bodykit fitting challenge @ Drift Allstars Wembley 2011 - YouTube. ALL AEROKIT© products MADE IN THE UK. See an Aerokit bodykit bumper being manufactured. Removed from a 2007 Qashqai, very good condition. This was removed from a 2012 1.5 dci diesel Nissan Juke TEKNA 5 door. Model - Juke (Tekna). Colour code - Arctic White (326 G). Year - 2012. Transmission -6 Speed Manual. The Aerokit Bodykit fitting challenge @ Drift Allstars Wembley 2011 - YouTube. ALL AEROKIT© products MADE IN THE UK. See an Aerokit bodykit bumper being manufactured. FITS: 350Z NISSAN. Item: FRONT WINGS. To fit any Nissan S14 S14a. Boss v2 Style Rear Wide Quarters 100mm each side with tail light covers. All our fiberglass parts are lightweight, durable and strong. We are focused on Lightweight body-panel production with P erfect Fit. NISSAN 350Z (2003 - 2005). - FRONT PART OF THE FRONT WHEEL INNER FENDER. CON PORTALÁMPARAS DE SOCKER. EAN Does not apply. Nissan Skyline R34 Z-tune Style lightweight front wings. Nissan Skyline R34 Z-tune style front wings. Will fit any Skyline R34! We are focused on Lightweight body-panel production with P erfect Fit. The Aerokit Bodykit fitting challenge @ Drift Allstars Wembley 2011 - YouTube. ALL AEROKIT© products MADE IN THE UK. See an Aerokit bodykit bumper being manufactured. FITS NISSAN 200SX 180SX S13. Video will open in a new window. Nissan Skyline R33 GT-R style Rear fenders. Will fit any R33. 50mm each side. We are focused on Lightweight body-panel production with P erfect Fit. Special order Carbon parts are made on order and dispatch can take up to 4 weeks. NISSAN X TRAIL 2007 -2013 PASSENGERS FRONT WHEEL ARCH TRIM. THIS ARCH TRIM IS A USED PART. THIS IS A GENUINE NISSAN PART. Headlights & Rear Lights. Rear Bumpers. Front Bumpers. Isle of Wight, Isle Of Man, Channel Islands, Northern Ireland, Isles of Scilly. Nissan Patrol Gr Y60, RH delantero overfender A Ala Junta, nuevo Genuino parte. Nissan Patrol GR Y60, RH front overfender to wing gasket, new genuine part. To fit any Nissan S14 S14a. Origin Lab Style Rear Wide Quarters. 50mm each side. We are focused on Lightweight body-panel production with P erfect Fit. Special order Carbon parts are made on order and dispatch can take up to 4 weeks. AEROKIT SPEC D2 REAR FENDERS. The Aerokit Bodykit fitting challenge @ Drift Allstars Wembley 2011 - YouTube. ALL AEROKIT© products MADE IN THE UK. See an Aerokit bodykit bumper being manufactured. FITS NISSAN 200SX 180SX S13. 400R STYLE OVERFENDERS SET. We carry no responsibility if our products are in-compatible with your vehicles and cause mal-function to your vehicle or to our products. PAIR OF REAR OVER FENDERS. Hence fitting by professionals is recommanded. Nissan 350z (2003-2005). - PARTES DELANTERAS DEL CONJUNTO PAR DE GUARDABARROS INTERIORES DELANTEROS. Reference OE/OEM Number 63844 CD000 63845 CD000. For Nissan S14 S14a. Carbon Wide Rear Quarters 50mm each side. Grams StylingPro Series is a premium Carbon Fiber part production line. All the products are made of finest quality Carbon Fiber materials using Epoxy resin infusion techniques to ensure the maximum lightness and strength of every part we make. Subject of sale: Wheel Arch/Spat. BODY STYLE. TRANSMISSION:6 Speed Manual. BODY STYLE:Hatchback. Donor car ENGINE NUMBER:162156. ENGINE SIZE:1461. Model:X-Trail T31. 1 x Arch trim. Colour:Matt Black. Position on vehicle: Passenger Left front. Body style: 4x4. South Hams Car Spares. 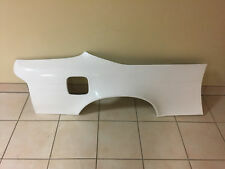 NEW NISSAN 350Z 2003 - 2005 FRONT WHEEL INNER FENDER REAR SIDE SPLASH GUARDS PAIR SET ( LEFT N/S RIGHT O/S). -NISSAN 350Z (2003 - 2005). - REAR PART OF THE FRONT WHEEL SPLASH GUARD. AEROKIT SPEC D8 ARCHES. The Aerokit Bodykit fitting challenge @ Drift Allstars Wembley 2011 - YouTube. ALL AEROKIT© products MADE IN THE UK. See an Aerokit bodykit bumper being manufactured. FITS NISSAN 200SX 180SX S13 D8 KIT ONLY. NISSAN QASHQAI MK1 J10 2WD 1.5 DCI 2007 OSR RIGHT DRIVER SIDE REAR WHEEL ARCH TRIM 93828JD000, AS PICTURED. REMOVED FROM NISSAN QASHQAI TEKNA MK1 J10 2WD 1.5 DCI (1461 cc) DIESEL 5DR ESTATE. COMPATIBLE WITH QASHQAI MODELS FROM 2006-2010 1.5 DCI AND 2010-2013 2.0 DCI IF PART NUMBER MATCHES. NISSAN QASHQAI DRIVERS REAR ARCH TRIM. THIS ARCH TRIM IS A USED PART. THIS IS A GENUINE NISSAN PART. Headlights & Rear Lights. Rear Bumpers. Front Bumpers. Isle of Wight, Isle Of Man, Channel Islands, Northern Ireland, Isles of Scilly. Special order Carbon parts are made on order and dispatch can take up to 4 weeks. All our products have to be fitted by professionals. Your browser does not support HTML5 video. 25mm each side. Made of finest fiberglass and Carbon Fiber materials. FITS BOTH TRAFFICS LHD & RHD. PARTE COLOR CROMO. EAN Does not apply.